Artists have always looked to nature for composition, color, and form. I am looking at nature’s technology, photosynthesis. Recreating photosynthesis is what I am exploring through the year 2020. These black bean ink paintings and solar panel paintings are a documentation of the ongoing process. Black bean ink is an Anthocyanin dye, a water-soluble red to blue pigment deriving from a flower or plant such as blackberries, blueberries, cranberries and black beans. Anthocyanins have the ability to produce electrical energy because they are phytochemicals, specifically flavonoids, which are essential to the plants biosynthesis and defense systems. I see the black beans as being manifestations of light, a result of the Ultraviolet wavelength. 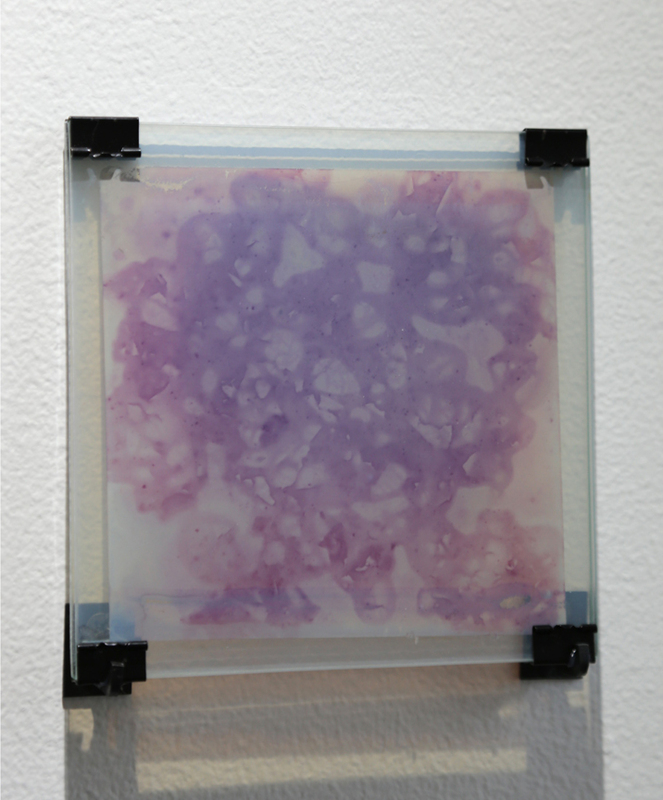 I have been painting with pH controlled Anthocyanin dye on various surfaces including glass and nano-materials. The ink will slowly oxidize over time, changing colors as a reaction to time and light. These paintings use the gallery light to create Alternating Current exhibited on the volt meter. Inspired by making drawings during the day and the love of cooking to feed my family, I developed ink from black beans. Black bean dye is Anthocyanin dye; a water-soluble red to blue pigment that comes from a flower or plant such as blackberries, cherries, blueberries, mulberries and black beans. Anthocyanins create electrical energy because they are a phytochemical, specifically flavonoids, which are essential to the plants biosynthesis and defense system. These pigments are used in solar panels a way of intersecting with light to recreate photosynthesis. Since researching my black bean ink and anthocyanins, I have set out to make contemporary paintings that use organic dye and nanotechnology to create electrical energy. Follow my process with me here and I am always looking for project collaborators. Feel free to contact me! Special thanks to Arts Council of Indianapolis for making this possible through the DeHaan Artist of Distinction Award.